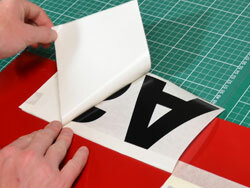 The top layer is called application tape; it allows you to transfer the decal to the surface you want to stick it to. The next layer is the decal itself. The bottom layer is the backing paper, the adhesive underside of the decal rests on this. Clean surface and remove any dirt, oils before attaching decal. 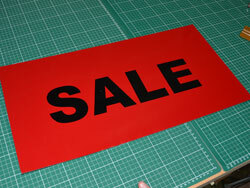 Place decal on a hard smooth surface (front side of decal facing up). DO NOT remove clear transfer tape. Using a credit card, squeegee the entire decal surface. 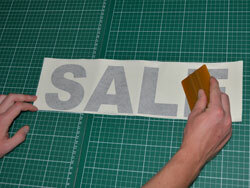 Apply medium pressure to the decal surface. DO NOT remove clear transfer tape. 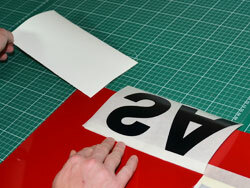 Apply a strip of masking tape to the top of the decal. 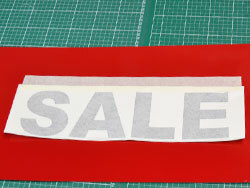 Position the masking tape half way on the clear transfer tape and half off. 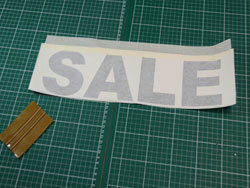 The masking tape that is off the transfer tape will be used to secure and position the decal. 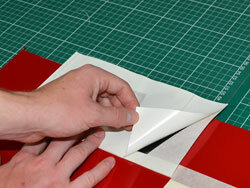 Attach and secure masking tape and decal for placement. 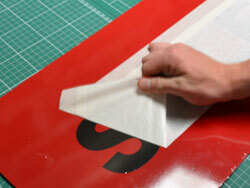 Squeegee the entire decal surface to allow proper adhesion to surface. Start from the top of the decal design and evenly squeegee in a downward motion from left to right all the way to the bottom of the decal. Tip : To remove any air bubbles under the decals after you have applied the decal, use a sewing needle, puncture the bubble and gently push the air bubble towards the hole with your ﬁnger.